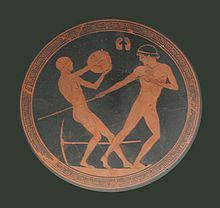 The pentathlon was first in Ancient Greece, and included the discus and javelin throw. A pentathlon is a sports contest with five different events. The name comes from two Greek words. Pente means five and athlon means competition. The first pentathlon was in Ancient Greece and was part of the Ancient Olympic Games. The five events were long jump, javelin throw, and discus throw, followed by the stadion (a short foot race) and wrestling. The modern pentathlon is a sports contest that includes five events. They are pistol shooting, fencing, 200 m freestyle swimming, show jumping, and a 3 km cross-country run. It was invented by Pierre de Coubertin. The event was first held at the 1912 Olympic Games. It was won by Swedish athlete Gösta Lilliehöök. Since 1949 there is a yearly World Championship unless there is an Olympic Game. ↑ Branch, John (November 26, 2008). "Modern Pentathlon Gets a Little Less Penta". New York Times. Retrieved 2008-11-27. This page was last changed on 24 February 2019, at 05:06.